Mix the sugar with the corn flour & the salt in a large saucepan. Mix together milk & the beaten eggs & beat well, then stir them into the sugar mixture until well blended & smooth. Place the pan over low heat & cook, stirring constantly, for about 30-45 mins. until the custard thickens & coats the back of the spoon. Cover the surface of the custard with a damp greaseproof or waxed paper. Let the saucepan cool, put it in the fridge to chill for about 2 hours. Separate the custard apple seeds along with the flesh in a bowl. Scoop out the flesh from the custard apples in another bowl. Wear plastic gloves; take off the flesh, keep aside in a bowl & discard the seeds. Reserve a few tbsps. of the seedless flesh to mix later. Puree the scooped flesh alongwith the seedless flesh in a blender. To this smooth mix add the prepared chilled custard with thick fresh cream, vanilla essence & blend it again for a few seconds. Add the reserved seedless flesh; stir well, pour it in aluminium or plastic container & freeze the ice cream. When a thick frozen outer rim is formed after about 30 mins. stir the ice cream well quickly & freeze again till serving time. 15 mins. before serving thaw it on the lower shelf of the fridge. 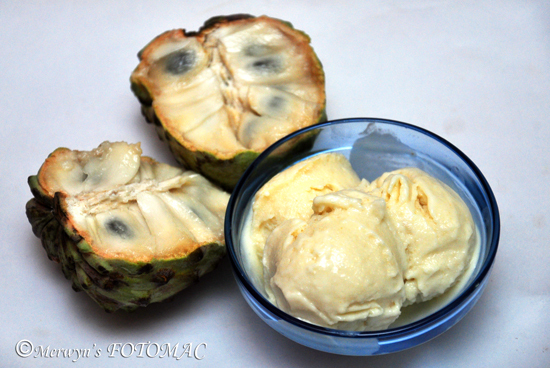 Scoop out the custard apple ice cream & serve in chilled cups or bowls.